Do You Know Where Jed Is? 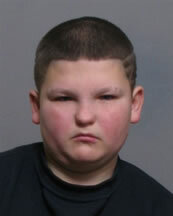 Suffolk Police are becoming increasingly concerned for the welfare of a 13-year-old boy who has gone missing from Acton. Jed frequently goes missing from the school and has been previously found at train stations in the Putney area of London. Jed Straker is a pupil at the Ryes School on Canon Pugh Drive. He left without permission at around 4.30pm on Monday 6th June without cash, and has not been in contact with staff or his family in the Lowestoft area. Jed is described as white, 5 foot 3 inches tall, of stocky build with short black hair and blue eyes. He was last seen wearing blue jeans and a grey hooded jumper, and speaks with a London accent. Officers are carrying out inquiries in Sudbury and London to locate Jed. Jed has complex behavioural needs and anyone who sees him should not approach him but call police immediately. Anyone who has seen Jed or who has been in contact with him should call Sudbury Police on 01473 615300 or Crimestoppers on 0800 555 111.